Dragon King Harbor River Pedestrian Bridge. HomeBlogArchitectureDragon King Harbor River Pedestrian Bridge by NEXT Architects. 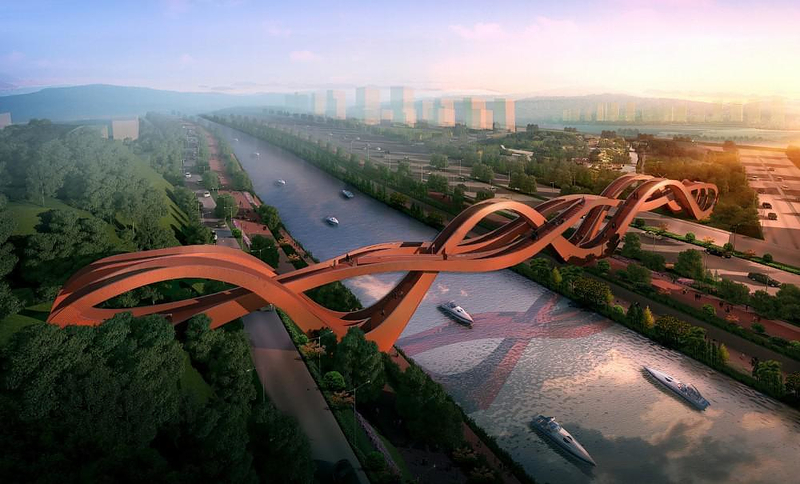 The dragon king harbor river pedestrian bridge is large-scale masterplan aimed at reactivating the Meixi Lake District besides Changsha, the capital of Hunan province in China. 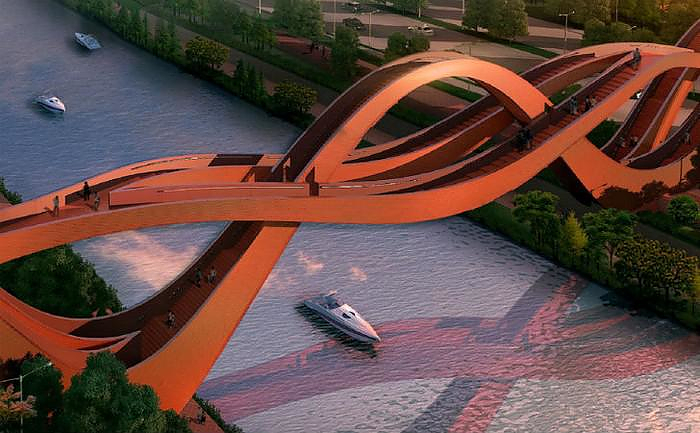 This impressive design is the wining proposal for a colossal pedestrian bridge by Dutch architectural office NEXT architects. With a total length of 185 meter and 22 meters height, the bridge becomes a dominating landmark. It connects a diversity of routing on different heights and symbolizes the renovation and development of the entire area. The iconic appearance contributes to the developing identity of the area and with its lighting contributes to the whole light routing along the river. It provides both a view on the Dragon King Harbor River as well as Meixi Lake, Changsha and it surrounding mountains. 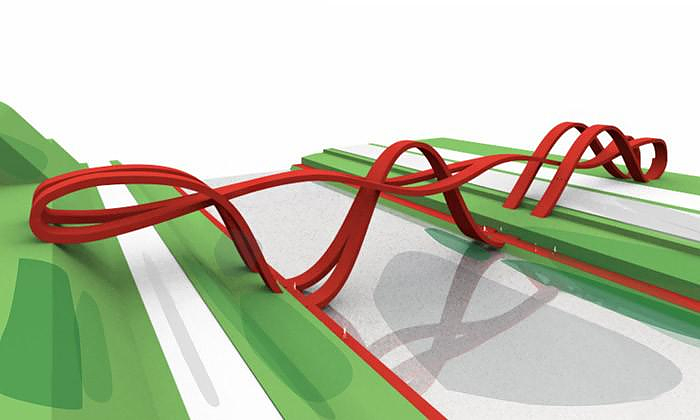 The structure will comprise of a sequence of undulating steel ribbons that are combined to create a never-ending surface, just like a Möbius strip. 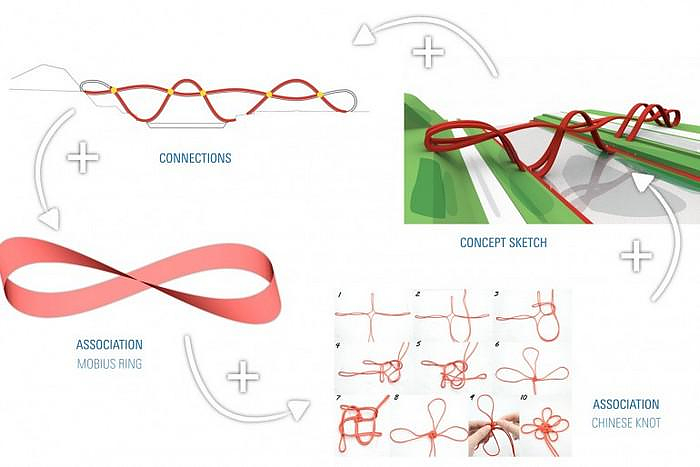 “The construction with the intersecting connections is based on the principal of the Möbius ring” said Michel Schreinemachers of NEXT Architects. Yet the form of the bridge also embodies a strong cultural symbolism. Architect John Van De Water says that the way the steel ribbons intersect refers to a Chinese knot originating from decorating ancient Chinese folk art. 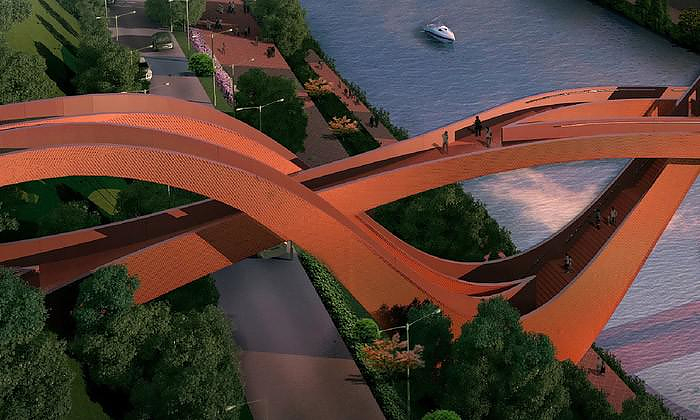 Moreover, we cannot help but notice that the profile of the bridge looks like a Chinese Dragon, making the bridge an emblematic new architectural symbol for the developing area. The dragon king harbor river pedestrian bridge provides crucial connection points along different planes along the harbor, from water’s edge to the elevated hills, and the various functions located in each location. However, the bridge is more than just a connection. It is the key project for the development of the public space of the river park in the Meixi Lake District. It will be the icon on the recreational and touristic light street along the Dragon King Harbor River.